Airbnb and VRBO have totally changed the travel game. Now, instead of choosing between an expensive hotel or a youth hostel, travelers have the option to stay in a short-term rental property like a home or apartment. This is helping travelers to save money, stay comfortably, and have a more authentic experience wherever they are visiting. Of course, the advent of the short-term rental is creating just as many opportunities for those of us who like to stay at home. If you’ve got an extra room or mother-in-law suite, or even if you are going to be spending some time away from home and don’t mind someone staying in your space, there is a lot of extra money to be made from short-term rentals! Below is a list of inexpensive, yet comfortable furniture that will help you transform your spare room or extra apartment into a money generating machine, and into a traveler’s fantasy. It is time to put that unused space to use and to welcome some enthusiastic adventurers to your hometown or city. Just pick up a few key pieces of furniture, and pretty soon your space will be the hottest rental in town. First, and most importantly, your guests will need somewhere comfortable to sleep. That used to mean dropping close to a grand in a local mattress store. But today, incredibly comfortable memory foam mattresses can be purchased for an insanely small amount right from Amazon prime! 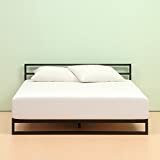 This mattress consists of 2.5 inches of memory foam, 2 inches of pressure relieving comfort foam, and 5.5 inches of airflow high-density base support foam. It compressed for shipping so that it comes in an impossibly small box. To set it up, just cut open the plastic and let it inflate for 24-48 hours. This inexpensive, convenient mattress is bound to offer your guests a better night sleep than any hotel mattress or sleeper sofa other short-term rentals are offering. Unfortunately, you can’t just put a mattress on the floor, despite how comfortable it is. A mattress on the floor will make you look like you are offering temporary housing, not something lux and enviable. This inexpensive bed platform solves that issue, without requiring you to shell out some serious cash on a bed frame. Set up is as easy as unfolding the metal frame and popping the legs into place. Once it is set up, set your mattress on top and make up the bed. You will instantly have a beautiful rental centerpiece that will keep your renters well rested and happy to leave a glowing review. If you need to store any personal items in your rental space, this piece also creates optimal under-the-bed storage space that won’t disrupt your renters in the slightest. To finish out your bedroom, make sure your renters have bedside tables on which to store their smartphones and maybe a glass of water. These inexpensive tables offer plenty of surface space and under-storage for luggage that will keep everything your renter needs conveniently at their fingertips. A bedside table may not be considered necessary by everyone, but it is an easy and inexpensive way to make your space as luxurious as a hotel. No tools are required for assembly, so it is easy to assemble and set up. Just set up two of these little end tables next to your memory foam mattress and bed stand, and your guests are ready to stay! If you are offering more than just a bedroom, the second most important piece in your rental property (next to the bed), is a good couch! 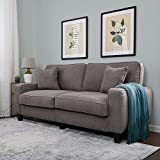 Your guests need somewhere comfortable to kick back after a long day of walking and exploring your city or town, and this reasonably priced couch is a great way to go. You don’t want to waste serious money on a piece that is bound to suffer shoes and spills, so instead order from Amazon and don’t worry not about how renters will treat your furniture. Some assembly is required, but nothing too dramatic. The couch even comes in three sizes and six colors for you to best match it to your space. Don’t leave your renters sitting in camp chairs or used sofas – buy them this great little piece instead! The next things your guests will need is a place to prop up their feet or to set down a drink. This inconspicuous coffee table is a great piece to place in front of the couch, and it is reasonably priced enough that scuffs and water rings won’t bother you. It offers clean lines which will complement nearly any style of décor and easy setup. It has an attractive, wood grain finish, and comes in four neutral colors. A coffee table will complete the look of your living room space and offer well-valued convenience to your renters. The last thing you will need to complete your rental space is a place for your clients to enjoy a nice meal. A lot of people choose short-term rentals for the access to a full kitchen. They can save money by eating in during their travels. If you have a full kitchen to offer, then make sure you have some nice seating available so that your renters can have the full dining experience. This modest little table set is perfect for visitors. 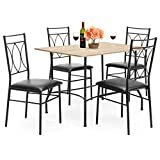 It is inexpensive yet functional and is a great place to enjoy breakfast or a simple dinner. These simple furniture pieces will quickly turn any extra space you have into an incredible rental opportunity. For less than $1,000, you can have your space set up and ready to make your money back for you.